Last November I began working on a very special Ketubah. Creating a Ketubah is very labor intensive and, I feel very sacred work. It was truly a project from the heart, a project of love on many levels, particularly for the loving couple that commissioned it. Nancy and Don wanted a testimony to their marriage of 19 years and had a most beautiful renewal of their vows outdoors at an Audubon Center with 100 people attending. It was a sacred and moving testimony of their love that had all of us in tears. I like to record different stages of my paintings. Since this was such an extensive and heartfelt project from beginning to end I would love to share some of the photos in the life of this Ketubah. The Ketubah before I added the calligraphy. 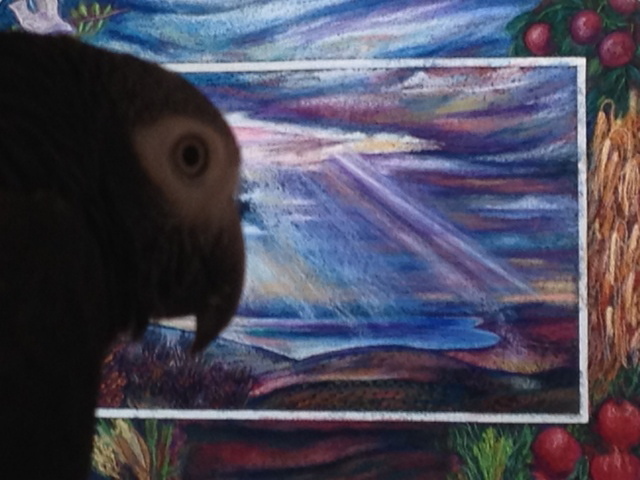 My special assistant (Heart, my parrot) basking in the Sea of Galilee and critiquing the work as she is of course my best critic! Laying out the calligraphy before I transfer it to the piece. Close ups of the calligraphy. The finished piece with the Hand made gold leaf frame and matt. Signing the Ketuah at the ceremony. 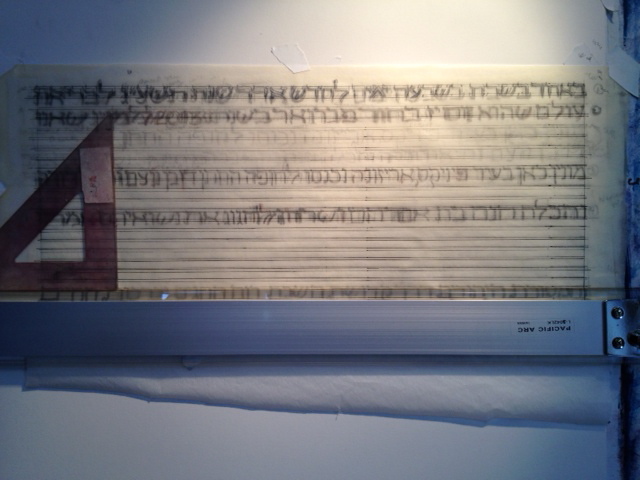 The Ketubah in its permanent home. The central theme of this Ketubah is sustance and love. It includes the seven species. The seven species were the biblical seven sacred sources of food of the ancient Israelites. They included wheat, figs, dates, barley, pomegrants. grapes and olives,. 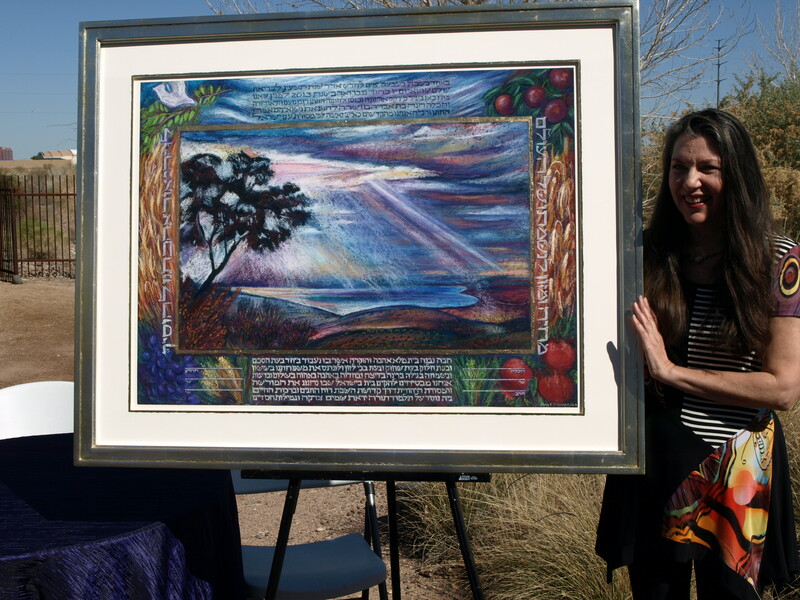 In this Ketubah I painted each of the species bordering The Sea of Galilee. One morning, as I was in the process of shetching layouts and discussing the commission, the line that I knew was meant to be in this piece came to me very clearly word by word. : “May the light of our love add sustenance and nourishment to the soul of the world.” This line is written in Hebrew in the borders of the piece. 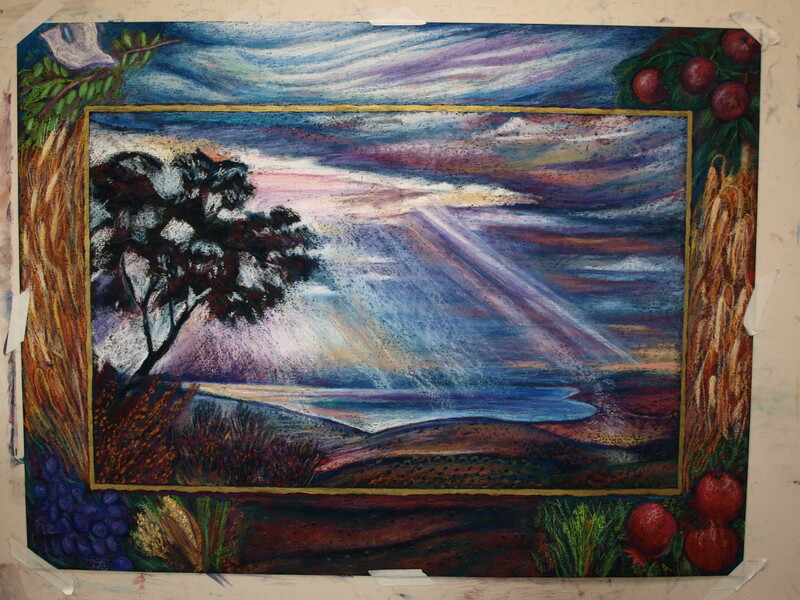 The image of the Sea of Galilee is from a study I did on site while visiting Israel. I love painting on site from life. Sitting with the Sea of Galilee stretched out in front of my eyes with the light pouring out of the sky in this “biblical” manner was to say the least, as good as it gets! It was a truly a gift to be there. When I returned home and looked at the study I was surprised to find that the sea is in the shape of a heart. This made it the perfect centerpiece for the Ketubah we were planning.